Wrens are the hardest working birds in the backyard. Stop and watch these little birds working on the ground and in the bushes looking for insects for their young and themselves. Nine species of wrens inhabit the lower 48 states. Because their ranges often overlap, it is likely that more than one species frequents your neighborhood sometime during the year. These tiny birds are most comfortable in bushy thickets in or near woods, woodsy overgrown sites in suburban parks and in shrubs and brush piles in backyards. Secondary cavity nesters, they set up housekeeping in existing holes in trees or available birdhouses rather than excavate their own nesting holes. Some, such as the Carolina wren are comfortable around humans and may build nests in hanging baskets, old shoes, nooks in roofs, eaves of porches--even inside homes if they can find a way indoors. Others, such as the winter wren are shy and retiring, rarely seen in yards unless they are migrating through. Most wrens migrate southward in winter, preferring to take the trip on their own instead of in flocks. They may occasionally join with others encountered by chance. House wrens are the least distinctive looking of all the wrens. They are five inches long, and sport gray-brown feathers with fine dark barring on their backs and wings. Breast and belly feathers are a dull beige or off white. Pale markings near their eyes and face are muted. They hold their perky tails at a characteristic jaunty angle, especially when burbling and chattering at length near their nests. The House wren, the busybody extrovert, is the wren most likely to turn up in your yard. It likes open areas edged by woodsy growth. Its range is most of the continental US and southern Canada. It heads toward southern climes during the winter--the colder the winter, the farther south it travels. Carolina wrens are the largest wrens in Northeast. They have rich, rusty top feathers, their edges marked by dark bars. Breast, belly and throat feathers are pale. Most conspicuous is their pronounced white eye stripe. They have slightly curved bills and pert tails. Constantly active and vocal, they are easy to spot by the sound of their chewee, chewee, chewee and tea-kettle, tea-kettle, tea-kettle calls. 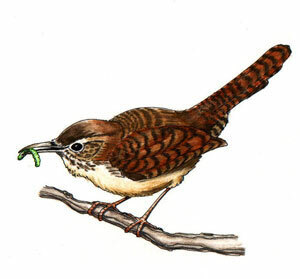 The Carolina wren, the state bird of South Carolina, does not migrate with the seasons, but it has expanded its range northward over the years. Originally a southern bird, it is now widely distributed from southern New England west to Iowa and down to Texas. It ventures more northward in mild winters, where many are killed if the weather turns really harsh. Winter wrens rank as one of smallest songbirds in North America at 4 inches long. They have the rusty-red feathers above and pale beige below marked by the characteristic wren bars. They also have perky tails and white eye liner. The Winter wren, the shy introvert, avoids humans. It frequents remote, dappled woodsy or swampy areas across the southern US and prefers stands of evergreen trees in rocky or mountainous areas up into the North and Midwest rather than populated areas.